An exasperated police inspector receives different eyewitness accounts surrounding a downed saucer and its female occupant. Mary is a disillusioned English banker's wife who meets a troubled Italian immigrant, Bruno. Mary is captivated by Bruno and they set off on a voyage together. In the course of their voyage, they meet a series of society's dropouts. A rather unusual agenda from tinto brass who obviously found later his niche in "t&a" movies. Col cuore in Gola is a psychedelic, pop art giallo that can just come from the great era of the late 60´s/70´s. Starting from the nice credits and music you immediately like this film and this is just the beginning! 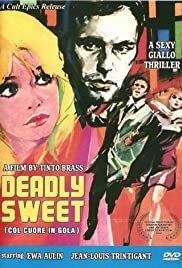 Trintignant founds in a nightclub a corpse beside the lovely aulin who just says "i wasnt it" Convinced that she is innocent he wants to help her and want to find out the murderer, Aulins brother should solve this case and both are searching for him. Though not quite without problems..a dwarf in raincoat is following them in companion with some gangsters who kidnap Aulin. Jean is now searching for aulin, aulins brother and (of course) the murderer. The Story itself is not that convincing (rather unimportant) but what here is really of interest is the unconvential style of brass : splitscreen(even tripple split screens!) some scenes in black and dark yellow filter and more.., and in the "middle" of course the presence of two very convincing leads: cool Trintignant and hot Ewa Aulin. (somehow priceless here in white fishnet stockings) the result is a quite good giallo with (obviously) strong references to pop art. In the same year Aulin and Trintignant appeared in the avantgarde giallo masterpiece "Death laid an egg", Col Cuore in Gola is not great as Giulio Questis film but is definitely entertaining.